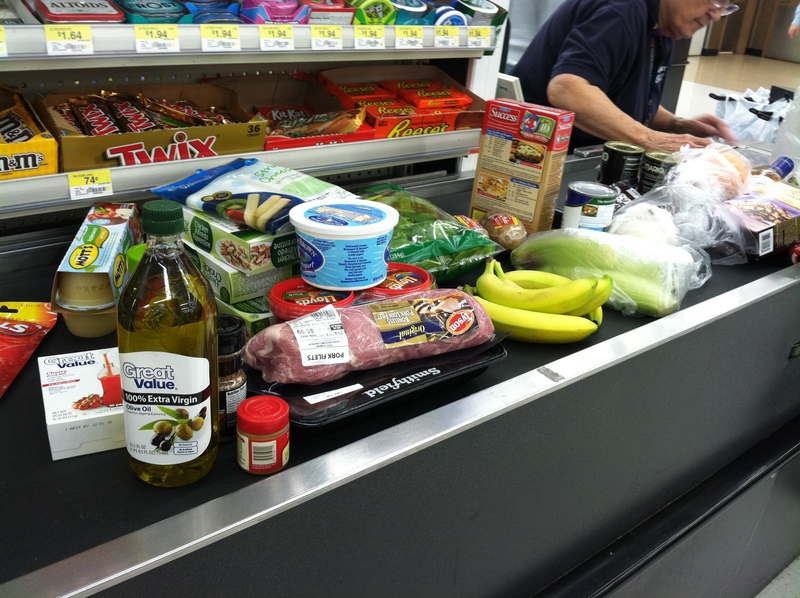 Groceries and a healthy dinner. I’m a very picky eater. I attempt new foods, but struggle with actually liking them. I am also super busy every day of the week, so sometimes it is hard to actually make a real dinner. I eat healthy, but dinner might often consist of beans and apples simply because of the convenience. One week from today I will be moving away from home to finish my junior year of college. I am fortunate enough to have my dorm room equipped with a full kitchen. Knowing my picky eating styles and my busy schedule, AL’s mom let me borrow several healthy cookbooks. Each book was filled with recipes that either took 15 minutes or involved 5 ingredients and were all low calorie/low fat/low sodium. This is a huge benefit for a busy gal like myself. I tagged the pages that looked the yummiest and made copies of them. With my new recipe book in hand, I went to the grocery store today to stock up. I was able to snag some great pork chops and got some other healthy things including fresh fruits and veggies. With all this new food and knowledge, I could not wait to cook tonight! 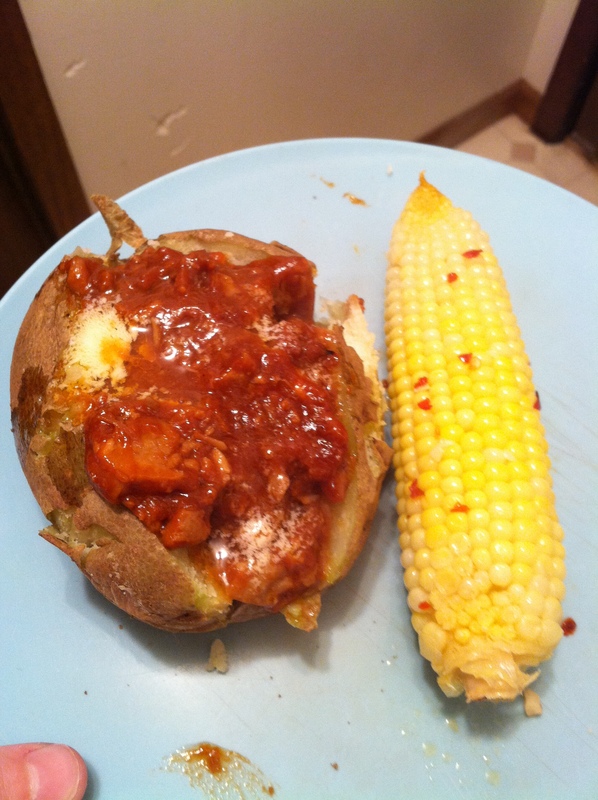 I chose something super easy: BBQ baked potatoes with spiced chipolte roasted corn. All I did was microwave the potato for 7 minutes then cut it down the middle. I added the yogurt spread to soften it up then put the cooked BBQ on top. Took all of 10 minutes. Bam. Delicous meal for 350 calories. Do you use cookbooks when searching for health recipes? Do you care more about healthy things or convenience? I think you can have both! That looks delicious! I am kicking myself for not going to the grocery store today, but I had a lazy day at home. I plan on heading there after work tomorrow. I am constantly on the lookout for easy, easy recipes! I’m convinced that I need to write a cookbook entitled, “The Lazy Girl’s Guide to Healthy Eating.” Since I cook for one, frozen veggies are my best friend and I cook all of my protein for the week at the beginning of the week. This is typically chicken which ends up on a salad or in chicken veggie chili, and I also boil about a dozen and a half eggs because they’re good to eat on the go and I love them. My motto is that healthy does not have to be hard! omggg! healthy eating + convenience! i need to know this cookbook. sounds so helpful! and your food looks YUMMY!